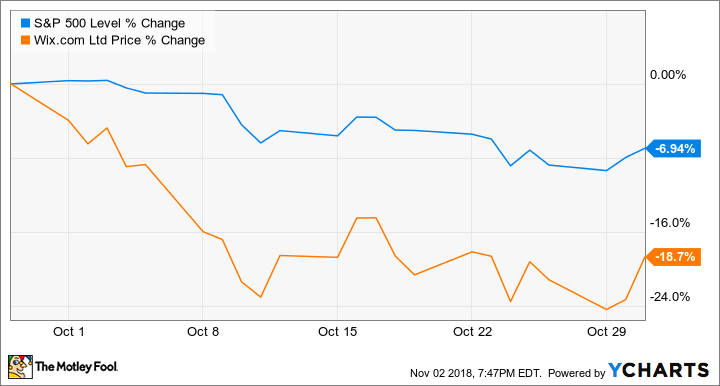 The website-creation specialist saw substantial pullback in 2018's spookiest month. Has the long-term outlook changed? Wix.com (NASDAQ:WIX) stock dipped 18.7% in October, according to data provided by S&P Global Market Intelligence. Shares lost ground amid last month's broader market sell-off. The website-creation company saw steeper declines than the broader market, but that's expected from a growth-dependent tech stock during a market pullback. There doesn't appear to have been company-specific news behind its performance last month. Despite the recent pullback, there hasn't been any substantive change to Wix's outlook since it published second-quarter results in July. The company has been posting strong growth thanks to demand for its customizable website services, and it still has a large addressable market to tap into. Shares are priced for growth, trading at roughly 126 times this year's expected adjusted earnings and roughly 8 times expected sales, but the company has avenues to living up to (and exceeding) its present valuation as it continues to expand its user base and adds new premium-service subscribers and offerings. 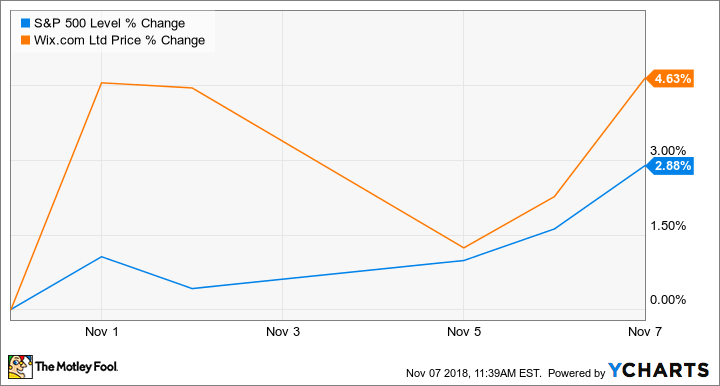 Wix shares have regained ground in November, corresponding with positive movement for the broader market and trading up roughly 4.6% in the month so far. Wix is scheduled to report third-quarter earnings after the market close on Nov. 13, and it's guiding for revenue between $152 million and $153 million (representing 37.5% year-over-year growth at the midpoint) and bookings between $161 million and $162 million (34.5% growth at the midpoint). Last quarter, the company increased its premium subscriber count 28% year over year to reach 3.7 million, and investors will be watching to see whether that level of momentum is maintained or surpassed.